November 1628, Elstow, Bedfordshire, England. John Bunyan was the son of Thomas Bunyan, a traveling tinker and Margaret Bentley. Learned to read and write at a local school. 1640: Bunyan started work as a tinker. 1644: He was conscripted into the Parliamentary Army during the English Civil War, joining at the Newport Pagnell garrison. 1645: Death of his mother. 1650: Birth of his blind daughter Mary. 1653: John Bunyan joined a Christian Fellowship and became a preacher. 1654: Birth of his daughter Elizabeth. 1655: The family move to Bedford and Bunyan becomes Deacon of St John’s Church. 1656: He began to discuss religion with the followers of George Fox, the founder of the Quaker movement, which led to his first book “Some Truths Opened” which was a violent attack on Fox. 1657: Formally recognised as a preacher. 1660: He was arrested on 12th November while preaching at a farmhouse in Ampthill, Bedfordshire for “devilishly and perniciously abstaining from coming to Church to hear Divine Service, and for being a common upholder of several unlawful meetings and conventicles, to the great disturbance and distraction of the good subjects of this kingdom, contrary to the laws of our sovereign lord and king.” He was imprisoned for twelve years in Bedford County Gaol where he wrote many other books. 1672: Bunyan was released from prison after the Declaration of Indulgence. 1675: He was re-imprisoned for a further six months during which time he wrote the first part of the book for which he is chiefly remembered “The Pilgrim’s Progress”. After he was released once more he became a pastor at Bedford until his death. 1684: He wrote the Second part of “The Pilgrim’s Progress” which tells the story of Christiana and her children. 1656: “Some Gospel Truths Opened”. 1657: “A Vindication of Gospel truths Opened”. 1663: “I Will Pray with the Spirit”. 1665: “The Holy City”. “The Resurrection of the Dead”. 1666: “Grace Abounding to the Chief of Sinners”. 1671: “Confession of my Faith”. 1678: “The Pilgrim’s Progress, from this World to that Which is to Come”. 1679: “A Treatise of the Fear of God”. 1680: “The Life and Death of Mr Badman”. 1681: “Come and Welcome to Jesus Christ”. 1682: “The Holy War”. “The Greatness of the Soul”.”The Barren Fig Tree”. 1684: “Pilgrim’s Progress Part Two”. “Seasonable Counsel”. 1686: “A Book for Boys and Girls”. (1692): “Of Antichrist and his Ruin, Works”. 31st August 1688, London, England after catching a chill riding from Reading in the rain. 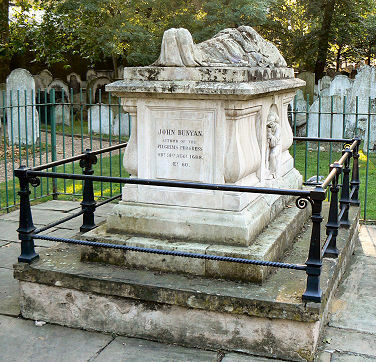 Bunhill Fields Burial Ground, City Road, Finsbury, London, England.